Tachyons are subatomic particles that travel faster than light. the aging process and strengthen the immune system. and upgrade the body's template. harmony works for mental, spiritual and emotional fields as well. 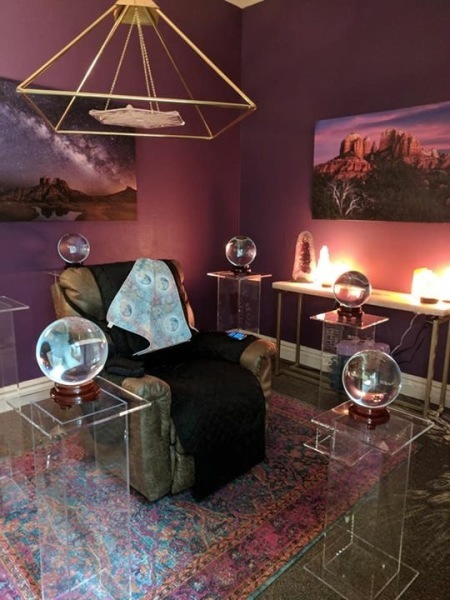 Our Tachyon Chambers are unique due to the very high amounts of Tachyon saturation within the chamber and the connection to the 12th Dimension Beings who we work with to flood the Tachyon into Earth through our beautiful sacred geometric pyramid and crystal generators. In addition, special use of a series of sacred geometries were formulated then added to the most cutting edge Michium technology in the Tachyon industry to bring about a Tachyon Chamber experience that many have described as an "Out of this World Experience"
Muscular, skeletal, circulatory, nervous, lymphatic, respiratory, endocrine, digestive, urinary, reproductive systems as well as cells, tissues and organs. are all replenished, recharged and rejuvenated. Multiple sessions may be required for more serious imbalances.